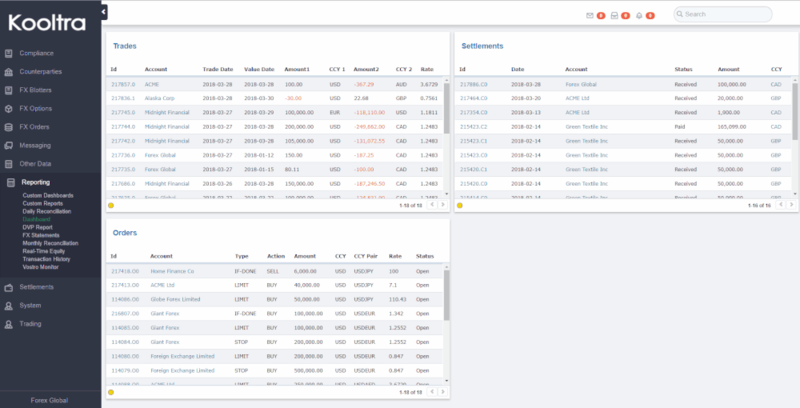 The daily reconciliation page was designed to allow finance and management users to reconcile their Nostro balances (assets) and Vostro balances (liabilities) in a given entity in Kooltra on a daily basis. In particular, it provides an overview of all activities that took place on a given day, which had an impact on the entity's cash position, and a process to reconcile/explain the change in its equity. The daily reconciliation report is generated everyday after the end of day process, by creating a snapshot of the end of day information. To access the Daily Reconciliation page, go to Reporting > Daily Reconciliation in the navigation pane. Review activities that happened on a given day. The top section of the overview page breaks down your equity by currencies and show its change compared to the previous date. The bottom section lists the line items that explain the change in equity between the two dates. The last line (Reconcile) displays any unexplained changes. The goal is to bring this number to 0, by posting adjustments. Cross check with your nostro balances with your bank accounts and liquidity providers to make sure they are accurately represented in Kooltra. If a nostro balance is updated, an adjustment of type 'Balance Adjustment' will be added to the Overview tab, contributing to the reconciliation. Once the Overview tab reconciles down to 0 by individual currency, it's time to review the total equity in the entity's base currency. The rates tab represent the accounting rates used to translate individual currency into the entity's base currency. Cross check the rates to ensure that they are correct. Typically they are updated on a monthly basis. Note that every time the accounting rates change, you incur a currency translation gain/loss line item. After the accounting rates are updated, the results tab displays your total equity in the entity's base currency, rolled up from the individual currencies using the updated accounting rates. This information is ready to be emailed to and reviewed by Finance and Management. The files tab shows the raw information captured at the end of day of the given day, providing the source of the calculations. By default, the daily reconciliation page loads the current date. If you are accessing the page before the end of the current trading day, you will see an empty page. To change the date, click on the date filter and select the desired date. Select a Currency from the Currency dropdown. Enter a Comment (optional). Kooltra recommends that you add a thorough comment for auditing purposes. Enter a Group. Adjustments can be categorized and grouped together. Ideally, the bottom line (reconcile row) of your Daily Reconciliation report would net out to 0.00 and you would not need to post any adjustments. However, this is not always the case, and the daily reconciliation report should be adjusted to account for missed information. These adjustments may not necessarily be missing transactional data, but may be adjustments such as payroll. The Nostros tab lists all the bank accounts in your entity, and their End of Day (EOD) currency-specific balance. You can use this tab to reconcile the EOD balance with the actual amount you have in your bank accounts. To access the Nostros tab, navigate to Nostros in the top-menu. If there are any differences in your records, enter the actual balance in the Adjusted Balance column. Repeat this for every nostro account. Once you have entered the Adjusted Balances, scroll down to the bottom of the page and click Update. If the update is successful, a message beside the Update button will say "Balances are updated successfully". The difference column will then show the difference between the EOD balance and adjusted balance. Note that if you refresh the page, the EOD balance will be set to the Adjusted balance amount and the Difference will go back to 0.00. If any of your Nostro accounts had differences, these differences will now be posted in the Balance Adjustment column of the Daily Reconciliation Overview. Kooltra allows you to adjust the accounting rates that were used to calculate equity in daily reconciliation. To do this, navigate to the Rates Tab in the top menu bar. The rates page lists the accounting rates that were used to convert each currency into the entity base currency. If these rates need to be updated, you can enter the new rate in the New Rate column. 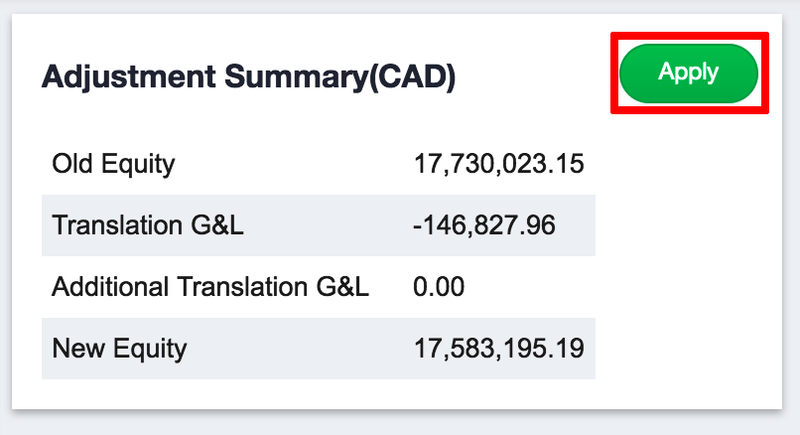 Updating the new rate will automatically calculate a Translation Gain/Loss (Translation G/L) and update the Additional Translation G&L in the Adjustments Summary card on the right. To capture the Additional Translation G&L, click the Apply button in the Adjustment Summary card. This will move the Additional Translation G&L amount into the Translation G&L and reset Additional Translation G&L to 0.00. If you would like to use the market rates instead of the accounting rates to calculate the equity, scroll down to the bottom of the page and click on the Update to Market Rate button. The results of the Daily reconciliation process are generated in the Results Tab. To access them, navigate to Results tab in the top menu bar. The results tab summarizes information that you would see on a typical balance sheet such as total assets, total liabilities and equity for cash and for line items. This result can be emailed out to relevant contacts by checking off the respective contacts and clicking on the Send Report button. Files pertaining to the Daily reconciliation process can also be accessed by navigating to the Files tab in the top menu.